The Canon IR-3235 is a multifunctional printer designed for medium-sized offices that require a secure but easy-to-share device. The Canon IR 3235 black and white office printer is praised for professional document finishing capabilities, lower running costs, and the extensive software that comes with the package, but it can be oversized and expensive to upgrade. Measuring 901mm x 565mm x 700mm, this 82Kg machine may be large and heavy, yet it comes in an understated-looking design suitable for any professional environment. The main unit follows a conventional build with the flatbed scanner and duplexing ADF on top, while the standard dual 550-sheet cassettes are at the bottom. An additional 50-sheet bypass input area is integrated. Connectivity options include RJ-25, USB 2.0, and two USB host ports. The control panel of the Canon IR-3235 printer features a colour display screen with minimal one-touch operational buttons and a numeric keypad. 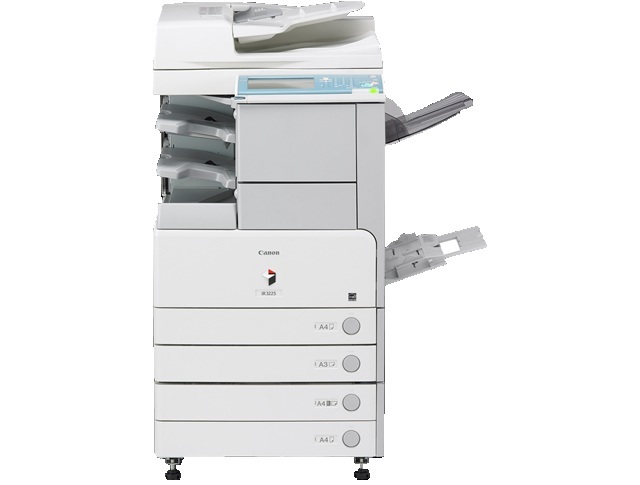 The IR3235 from Canon is multifunctional with fax, Wi-Fi printing, enhanced security, environment-friendly and energy-saving features, and efficient cost and management controls. The Canon IR-3235 features a full-featured software to streamline workflow. Centralised management of networked devices is possible. The Canon IR-3235 laser printer is also fast, capable of printing up to 35ppm, while other time-saving features include the duplexing automatic document feeder, a range of finishing options, and direct printing from USB thumb drives. Creative workgroups may find the Canon IR 3235 multifunction printer inefficient because of the absence of colour printing. The device itself is already expensive to buy, and upgrading it for higher memory and additional document handling options means spending more. The standard 600x600dpi resolution of the Canon IR-3235 does not guarantee the best-looking graphics. The machine could take up more space sideways because of additional paper handling features.